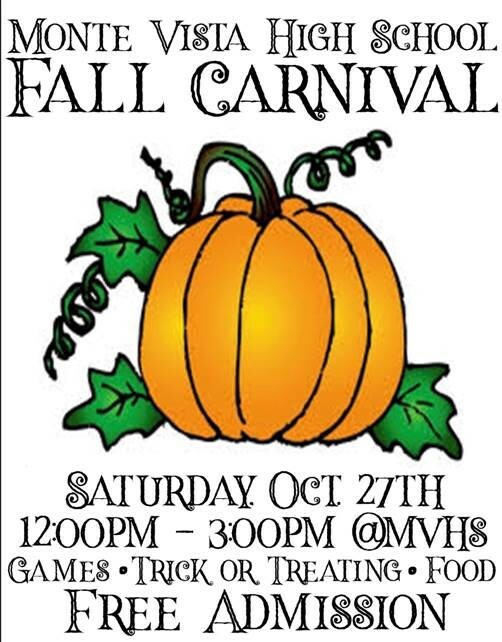 On October 27th from 12-3pm Monte Vista hosts the annual Fall Carnival for our community. Young children and elementary students enjoy the games and trick or treat activities. This year we are building on the tradition by collaborating with the Drama department who will offer trick or treating inside the ‘haunted’ house. Please consider supporting this free event by donating some of the following items to the Leadership Classroom before 10/27 or to the amphitheater by 11:30am on 10/27. 20 Desserts homemade or store bought cookies, cakes, cupcakes, etc.